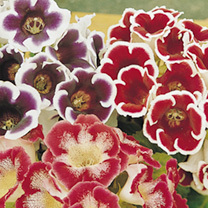 This great offer contains 6 gloxinia mixed tubers and 2 planters:Gloxinia Mix – A lovely blend, producing large, trumpet-like blooms in shades of scarlet, white and violet, many attractively bicoloured. Ideal for growing in 12cm (5) pots for houseplants. Flowers August-September. Height 30cm (12). TP – Tender perennial.Planters – Unusual cream and brown raffia planters. Ideal for patios. Measurements: 32cm x 16cm x 14cm.